A highly-fortified, high-energy textured grain concentrate for lactating mares, foals and weanlings. Grain products, plant protein products, processed grain byproducts, roughage products, molasses products, monocalcium phosphate, dicalcium phosphate, magnesium sulfate, potassium sulfate, salt, zinc sulfate, ferrous sulfate, manganese sulfate, copper sulfate, ethylenediamine dihydriodide, cobalt carbonate, sodium selenite, vitamin A supplement, and vitamin D3 supplement, vitamin E supplement, menadione sodium bisulfite complex, choline chloride, riboflavin, calcium pantothenate, niacin, biotin, folic acid, thiamin mononitrate, pyridoxine hydrochloride, vitamin B12 supplement, sodium selenite, zinc proteinate, manganese proteinate, copper proteinate, natural and artificial feed flavors and yeast culture. Creep feed to foals beginning at three months of age. Feed at the rate of 1.0 lbs. per month of age. Do not feed free choice. After weaning, feed at the rate of 1.0 to 1.5 lbs. per 100 lbs. of body weight depending upon body condition. With good forage, yearlings may be switched to a 14% grain mix at fourteen months of age. 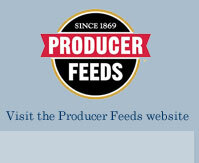 Feed to lactating mares at 8-12 lbs. per day with liberal amounts of forage. 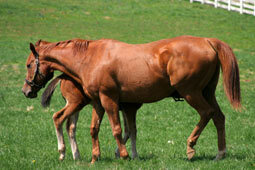 Adjust feed intake according to mare condition, milk production and forage quality.